This entry was posted in awards, events, invest, press release, registration, staff on November 24, 2018 by Jovan Hackley. 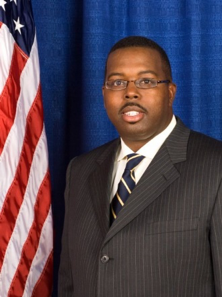 GRAMBLING, LA – September 13, 2018 – Grambling State University President Rick Gallot today announced the appointment of alumnus and California native Shannon Frank Reeves, Sr. as its Director of Alumni Affairs. This entry was posted in advancement, alumni, gramstory, invest on September 13, 2018 by Jovan Hackley. 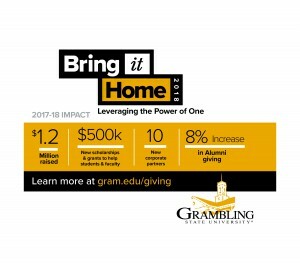 This July, Grambling State University’s Bring it Home kicked off with a number of major donations from alumni, staff, and corporate donors raising $218,000 in one month. This entry was posted in alumni, bringithome, invest, money on July 27, 2018 by Jovan Hackley. 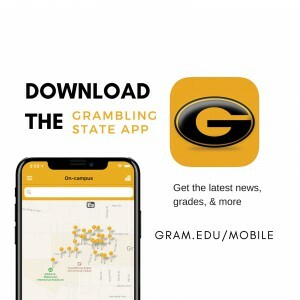 Now you can promote Grambling State University wherever you go. Ride with G and get the new GSU License Plate at gram.edu/licenseplate. This entry was posted in bringithome, gramstory, invest on July 16, 2018 by Jovan Hackley. 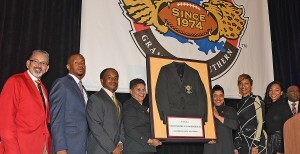 Why Help Grambling State University Bring it Home? 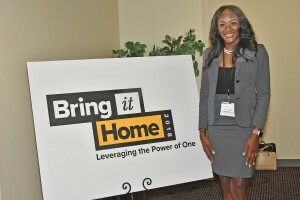 Last year’s Bring it Home fundraising campaign garnered a headline-making $1.2 million in support. While the numbers are impressive, the real power of the investment that our alumni, community members, and corporate partners have made will be felt for generations. Here’s a short recap of a few amazing things that happened as a result of last year’s Bring it Home and why you should invest to make this year’s campaign even bigger. 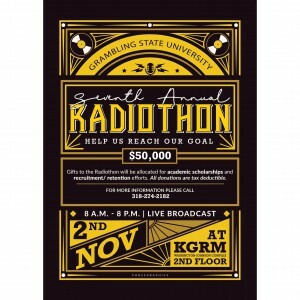 Last Year’s Bring It Home campaign helped provide more than $250,000 in direct support for students in need. 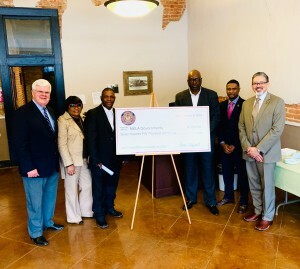 This aided the university in impacting the balances of hundreds of students through a variety of scholarships; including GAP which is designed solely to support students in reaching the academic finish line. In 2017, each of our active alumni chapters did an amazing job spreading the word and growing the investment our past graduates make in Grambling. That investment showed up, not only in the dollars on the balance sheet; it resulted in an eight percent increase in alumni giving. The University also benefited from student recruiting, guest speaking, and other networking opportunities that continue to create success. Let’s Bring it Home Again! Because of last year’s enormous success, we’re continuing the drive for a second year. Visit www.gram.edu/giving/ or join us on campus for the Coffee Kickoff for Bring it Home 2018 while you are in town for the Alumni Convention weekend. Thank all of you for your support and creating the impact that makes the difference for our students and campus community. This entry was posted in advancement, alumni, invest, money on July 5, 2018 by Jovan Hackley.